I know that you’re gearing up for the big holiday feast, but you still have to eat a regular dinner the next few days. To make more time for prepping, you need an easy-to-make dinner that cooks while you are at work or running errands. 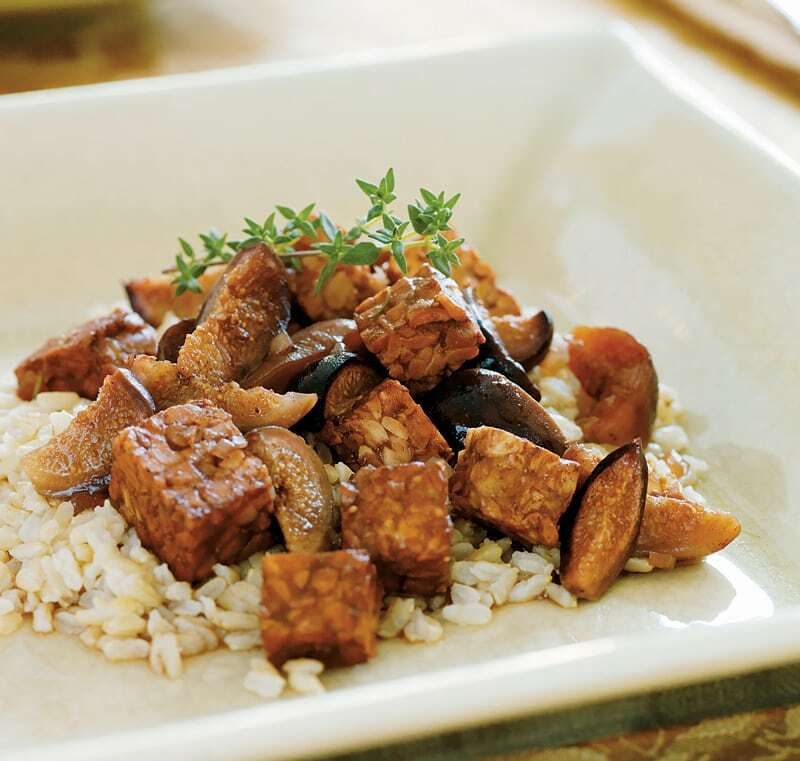 Slow Cooker Tempeh Braised with Figs and Port Wine is from my first cookbook, The Vegan Slow Cooker and cooks up perfect in your crockpot. This recipe embodies what I love about slow cookers – very little hands on time and it cooks without supervision. If you’re new to tempeh, it’s an Indonesian soy food. It has halved soybeans in it and is cultured. 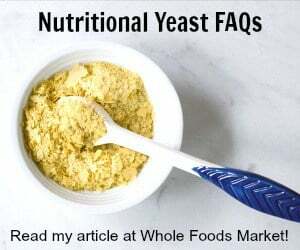 It’s a great substitution for any of your old non-vegan recipes and holds together great in the slow cooker. You can make this with balsamic vinegar in place of the port wine – but only use 2 tablespoons vinegar and add extra water to make up a whole cup of liquid. Looking for a sophisticated dish? Well, look no further than this recipe from my first book, The Vegan Slow Cooker. 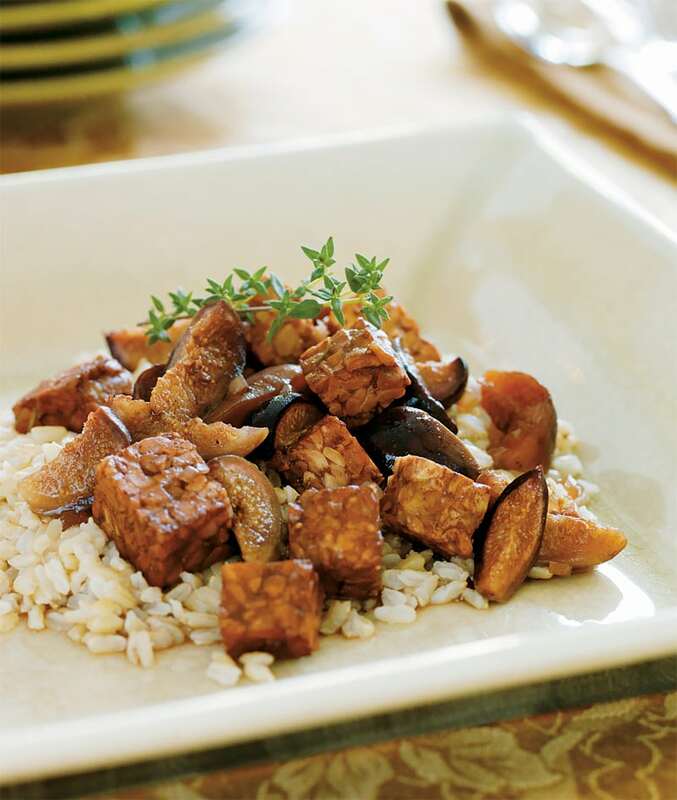 This recipe combines the complex flavor of port wine with fresh figs and nutty tempeh. Serve over mashed potatoes with roasted asparagus for a meal that will wow the toughest critic. Heat the oil in a skillet over medium heat and sauté the onion until translucent, 3 to 5 minutes. Add the garlic and sauté for 1 minute longer. Combine in an airtight container with the cut-up tempeh and figs and store in the fridge. In the morning: Combine all the ingredients in the slow cooker. Cook on low for 6 to 8 hours. This looks amazing! Did you use tawny or ruby port? Good question. The last time I used a Zinfandel port I got at Trader Joe’s but I have no idea which one it is! We made this last week and it was INCREDIBLE!!! My wife and I loved it. In fact, she requested that we put it n our reglar rotation of dishes to cook at home. The following week, we made 2 batches in the slow cooker. Great stuff!!! Thanks for giving the balsamic vinegar alternative, since it’s impossible to get kosher Port. Would any other sweet or dry wine work? We can get a variety of those, including the way to sweet for drinking Magin David or Manishevits. Also would this hold up if everything went in at 5:00 or 6:00 and the dish isn’t served until 1:00 p.m. on shabbat? It would work with dry or sweet wine, the end flavor would be a little different – but both would be good. If you are talking about cooking it for more than 12 hours I would add at least an extra cup of water/broth just to make sure it doesn’t burn. Also I would use dried figs in that case so they don’t break down as much as the fresh figs will. I am planning to make this in the next couple of days. It looks great. I am trying to avoid consuming oil. Could I add extra water or vegetable broth in place of the olive oil? The oil is only used to sauté the onions, so you can dry sauté or sauté in broth to make it oil free. Could this be done with dried figs instead of fresh? If so, any changes you would suggest? Yes, you shouldn’t need to change anything else. Would this work without the overnight marinating? I am putting it in the slow cooker in 10min. Will let you know! I love this recipe and have made it several times in the crockpot as written. How would you recommend translating the recipe to the instant pot? Thanks! Does anyone have a recommendations for how one might cook this in an electric pressure cooker (such as the Instant Pot), instead of in a slow cooker? Thank you for any advice. If you are using a 3 quart, there’s definitely enough liquid to bring it up to pressure, and it might be enough for a 6-quart. The easiest way to convert it would be to use the pot in pot method. Put all the ingredients into a large pyrex bowl that fits in your IP. Cover with foil. Add 1 to 2 cups water, the rack that came with your IP. Place the covered bowl on the rack. Cook for 15 minutes on high pressure.